The Hangprinter plugin doesn't work, don't use it. The calibration procedure is outdated and will not work. It also gets motor directions the wrong way. I've never used it myself, but it has severely complicated debugging that I've participated in. I know this is off topic here but could locate no better place to contact you. A group of which I am a member (located in New Jersey, USA), is embarking on a hangprinter project. We aren't smart enough to hew to the known parameters, so we are trying to engineer something new for ourselves. We have a space large enough for 7-meter radii and greater vertical, if desired. Our plan is to mount motors, gears, power supplies, and transceivers at the radii and on the mover, connecting the whole thing with Bluetooth or WiFi. Thus the mover will hold the extruder (probably dual), fans, power supply, transceiver, and the vertical drive and gearing. We hope this won't prove too heavy; we do plan to counterweight it. We have no current plans for any of the electronic and drive exotica that you are engaged in but could be convinced to try. We recognize that this is a significant departure from the norm that you have established but are daft enough to pursue it. Whether we have the technical capability will come out as we proceed. If you choose, you could be a valuable resource for us. I'm guessing that we'll need all the help we can get. -First, is the basic idea sane? -I think the kinematics look simple. If I am wrong, point me to a lucid discussion of the issues. In any event, do I need to be concerned with anything other than the basic positioning of the mover, accurate location of the four fixed points, and being certain that all drivers actuate according to identical timing profiles? -I worry about the tensioning of the lines in what is clearly an over-constrained system. I caught the item about not using stretchy line but am also concerned about line weight and so on. Are these really issues? If so, have you proposed solutions? -I noted the issue of line build-up affecting spool diameter. My proposal is to use a drum with threading on the exterior to permit a flat wind. With sufficient diameter and length, I calculate that it will accept as much line as we need. Comments? An alternate system uses pinch rollers and a separate take-up system [similar to the tape columns on early main-frame computers, if your memory goes back that far]. This seems overly complex but do-able. Comments? -The geometrics of the available build volume seem a bit elusive. Making the mover larger or putting extended arms on it will make the neck at the top larger but seem to cause a reduction in the diameter near the bottom through the movement restriction. Is this correct? -Finally, since this is clearly a branch from the main thread of HP3.3 design, where would you prefer that I contact you, if indeed elsewhere? Cool that you're designing a cable driven 3d printer! I think you'll like the Mechaduinos. They will let you auto calibrate anchor locations and never worry about lost steps. I think you might regret counterweights. I used it back in 2014/2015. See my blog posts and forum posts from that time for details. I think it's easier if we use the word "Hangprinter" only when we mean the 3d printer that is designed by the Hangprinter Project. - and parallel reprap 3d printers/machines/robots. I don't have a trademark or anything, so you're free to use the words you like, but using the four descriptive phrases above will avoid confusion. If you want my personal support on non-Hangprinter design problems, PM me your email, and I'll give you a price. Edited 1 time(s). Last edit at 03/11/2018 05:44PM by tobben. Really interested in making one of these myself. I have seen in the videos that you can enter a value for how far above the build surface the 3 anchor points are. Is it possible using this setting to have the anchor points on the ceiling? My thinking for this is that once built I would like to leave the printer in place so having the anchors on the ceiling would mean that I could lift the print head up to the ceiling when not in use and all the lines would also then be up and out of the way and may also allow for a larger print area as the lines wont hit the print. Ime quite a way off putting it together as need to build the workshop that the printer will live in first but am hopefully going to get started on printing the parts I need soon. The answer to your question is yes, you can use the firmware as you suggest, even though Hangprinter actually has four anchor points. The geomery you propose has been discussed in the v2 thread. Great thanks ill have a look through, will update on progress here. Hang printer v3 corrections came out today. I think I covered all the issues I have encountered. I do plan on checking out all of your new 3D printed parts in the future. As always, if there is anything I missed or anything you would like me to cover just let me know. Happy to help. I'll also try using a separate thicker hotend heater-wire for my coming couple of builds, and see if I like it better. Most of the way through printing the parts for my build now just a few more large gears to go. Got nema 17 steppers an E3D titan aero with volcano for the hot end and extruder. I am also going to be using Duet electronics as I have a spare Duet 0.6 board and have not yet used ramps so am more comfortable configuring the duet. Need to see if I can get hold of an expansion board for my 0.6 though as I am a stepper driver short or steal the duet shield from my Ormerod 2. Not sure if anyone has built one using Duet electronics yet but will see how far I can get. Unfortunately I wont be able to test some of the more advanced duet features as I don't have a Duet Wifi / Ethernet. I also have a precision pezio sensor here that ive not used so my try and hook this up for z homing. Are you planning on putting Marlin onto the Duet, or will you use RepRapFirmware? Will you use Mechaduinos/Smart Steppers or open-loop drivers? Ill be using RepRapFirmware 1.2 beta which supports hang printer although I don't think anyone has actually tested it on actual hardware yet. I haven't got any Mechaduinos/Smart Steppers just going to use the stepper drivers that are one the 0.6 duet with my nema 17s as a starting point to see if I can get the printer built and moving using RepRapFirmware. There is a write up on the Duet3D website for configuring the duet for hang printer and some auto calibration using a Z sensor which I hope to use the precision piezo for. For the moment I am just going to try and build it from spares I have got here so already have a board and the steppers, just need the bearings and fishing line which I think you put a link to a few pages back. I should be able to test the movement with my current board as it has enough stepper drivers for that, then I can either get an expansion board to give me enough drivers to run the extruder or upgrade to the Duet wifi / Ethernet and see if I can use some of the stall detection features as mentioned on the Duet 3D site. Also thought that I may be able to use some crimped on fishing weights on the line that could be used to activate end stop switches to help with homing but not thinking about that until ive got it up and moving. 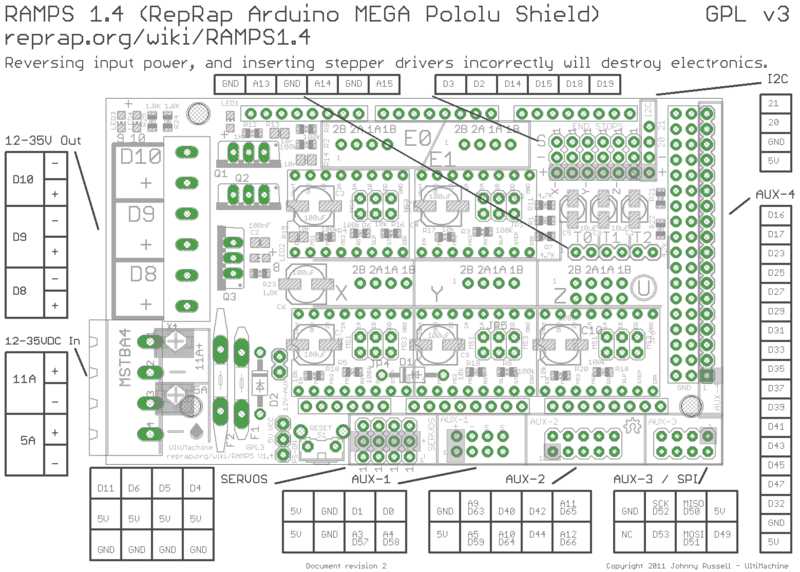 If I cant get it running with RepRapFirmware then I will get myself a ramps board and use your branch of Marlin. Ok nice. I'm very interested in reports on how RepRapFirmware's Hangprinter-implementation works. Hey all, how are your builds progressing? Documentation is published straight into the Hangprinter repo: [github.com] You can use Github issues, comments and pull requests, or post in this forum thread if you want to collaborate directly on documentation. The guide looks great! I really like the template for the top plate as well. I hope to try some of the new zip tie parts on a future build. I have been working on some really large prints, but haven't had time to share them as of late. To many projects, to little time. I watched the Sweden 3D meet up video Tom put out. Great to see the improvements. The printer you had there looked like it was printing really well. Keep up the great work. I will post some updates as soon as I have them. Hope to start putting mine together shortly. All printed parts are ready. The fishing line and all the bearings arrived last week. I have upgraded my duet 0.6 to the version that suppprts hangprinter. Just need to finish off my workshop now hopefully get the roof and floor in once ime back fron holiday. The assembly guild looks fab very usefull. Have access to a large format printer at work so will be printing out the layout file as one large print and laminating it onto my ceiling board. Does somebody here want to attend a super awesome Hangprinter workshop? I wish I could more than anything. It's just to far. Is there going to be any of these sessions recorded we can watch later? Thanks. Fingers crossed there will be a US edition one day. There will be some sort of video production. Not sure about the details, but I'll share and forward everything as much as I can. I want to connect my Mechaduinos with the 4 channel I2C logic level converter and the Ramps/Arduino. Where can I find a shematic of the electronic wiring? I afraid there's no proper wiring diagram in the project yet. 12V/24V into the blue connector. The step/dir signals are taken directly from the sockets of the RAMPS' stepstick sockets without being level shifted. The Mechaduino can handle 5V directly on its D0 and D1 inputs. HV on that one would connect to 5V (can be taken from Mechaduino or RAMPS, doesn't matter). LV would connect to 3V3, which is easiest taken from the Mechaduino. Some level shifters require you to also connect ground. Wire all four Mechaduino-side SDA cable into the same electrical node on the low voltage side of the level shifter, for example L1. Similarly all four Mechaduino SCL goes to for example L2. 12V/24V goes to the 5A input. Thanks, If I get everything to work, I will support you with a wiring diagram. Could you maybe post a high-res photograph of your electronics as visual support to your description? I should mention here that the Mechaduinos' VIN 5V source should be an external voltage regulator device. I've just used 5V pins on the RAMPS before, and it works, but people who are better with electronics than me say this is a bad practice and might break. The Mechaduino guys have some advice on how to get nice 5V for VIN. See the Mechaduino manual page 15. Did anyone here wire the Arduino/Ramps in the right way (hangprinter works!) with a 4 channel I2C logic level converter and Mechaduinos and can post a high-res image? Edited 2 time(s). Last edit at 05/23/2018 03:37AM by Dahah. I am waiting for an answer to my last post. Meanwhile I am going to build the mechanical part. I printed the layout a4 template and taped it all together. There are no calibration lines to put it on the 500 mm x 500 mm top plate. I put everything in place like I saw it on the images in the assembly instructions. But I doubt if I can see the exact position on the images. Is there anything I have to keep in mind while placing the template on the top plate? Does one lineroller or all D-linerollers need to be in a specific place on the top plate? I want to use the frame Tobben posted on his blog (Makerfaire Rome) and I wonder if the postions of the top plate will influence the geometry of the "hangprinter in a frame"? A possible answer to my own question above: The D-linerollers on the "top plate (attached to the sealing)" form a triangle which is exactly the size of the "mover (endeffector)" triangle. The middle point of that triangle has to match the middle point of the triangle from the base of the wooden frame pyramid (Makerfaire Rome) on the floor. It has to match the top point of that pyramid, too. Hello. it's a great machine ! is it possible to minimise the nacel dimension? wath is the minimum size of temporary frame.. because I'm planing to built one with frame. @Dahah Yes, that is correct! @cdriko Yes, just put the nozzle you want on there and configure it in your slicer. I don't know the minimum size of either nozzle or frame actually. I've never gone small with the Hangprinter myself. But it sure would be interesting!